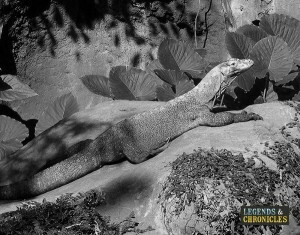 The Komodo dragon is often recognized as the largest living lizard on earth, and was first discovered by Europeans back in the early 1900’s where they were described as a crocodile that lives on the land. A striking creature the Komodo dragon is an imoposing sight, especially when it stands on its hind legs to survey its territory. The Komodo dragon is in reality truly a giant reptile. On average a Komodo will weigh up to and over 300lbs and grow to 10ft long, but this is just an average representation of the species and they can of course grow much bigger and much more powerful. The Latin name for the Komodo dragon is Varanus Komodoensis, it’s part of the Varanidae monitor lizard family, which in turn is part of the Greater Reptilla class. The Komodo dragon like the greater monitor lizard family are suprisingly good swimmers, they can happily make their way in water, even through rough currents and tides. This is one of the features that has helped the Komodo dragon to spread itself to new homes and islands over the years, although their swimming skills and prowess typically decline with age and with the additional of more body weight or size. Like all monitor lizards the Komodo dragon is a stocky, powerfully built lizard. They have long powerful tails that they can use to attack prey by whipping and lashing out at them, and they can cause cause serious damage too. They have snake like heads with forked tongues which they use to smell, and they have short but strong limbs that they can use to grapple, claw and attack enemies, rival mates or potential prey victims. The Komodo dragon starts life as a youngster with brightly colours speckled scales covering its body. As the Komodo dragon grows and matures the scales become darker, more grey, more browny and clay coloured with the females showing more colour on their sides in adulthood than the males, although them to be distinguished quite easily. The Komodo dragons skin itslef is made up of tiny scales, which contain bone, and these bony scales give the Komodo its own natural armour plating. The armoured scales while offering excellent protection, do limit the sensing ability of the Komodo dragon, and its reported that certain scales themselves do possess sensing pads, their own little temperature sensors. These sending pads are more abundant around the head, neck and feet of the Komodo, and allow it the ability to sense its environment effectively, without incuring harm. The Komodo has a very effective sense of smell, but not in the sense we do. 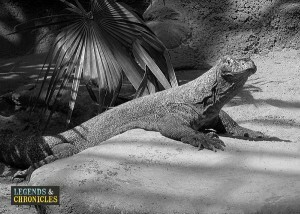 Similar to many other reptiles, the Komodo dragon actually uses its forked tongue to collect scent from the air. By flicking its tongue in and out of its mouth, the Komodo transfers the particles from its tongue to the roof of its mouth where the scents are send and then processed by the dragons brain. This technique of capturing smells allows the Komodo dragon to sense things up to a few miles away, and is an excellent tool for them to track prey in their habitat. The Komodo dragon poisonous bite, or its venum is something that has long been rumoured. Many people believed the Komodo dragon mouth does contain some mild venum, although this has been argued in recent years. The common theory that is currently popular on the Komodo dragons bite being deadly is now thought to be due to the amount of bacteria in the dragons mouth, and therefore its saliva. This in turn would make any puncture marks on a foe much more deadly, causing swelling and numbness due to the foreign bacteria that the Komodo dragon is used too, but its prey is not. The Komodo dragon begins life quite slowly, similar to how they meander around as an adult, and they typically don’t reach maturity till around five years old. That however wont stop them growing, after their main growing phase, although they slow down dramatically after this intital growth period. The female Komodo dragon lays her eggs late in the year, typically at the end of the summer months around september, traditionally laying up to twenty eggs which require incubation for up to 8 months. Once hatched, the young Komodos are vunrable and relatively weak, they are typically quite small in size up to 12 inches on average, and they have to learn to defend themselves fast. Young Komodo dragons are typically reliant on their camoflauge to evade larger predators, and many won’t survive past their first year. Those that do take advantage of trees, and move upwards from the ground to evade any potential predators, and enhance their survival rate. At its full growth a Komodo dragon can grow to be an impressive specimen. The largest Komodo dragons will grow up to 10ft Long and will weigh over 300lbs, but of course, many sightings have told of much larger Komodo dragons in the wild. The Komodo dragon due to its size is a powerful force in its home environment. Its diet consists of birds, mammals and invertebrates and like most reptiles it’s a carniverious animal. Basically the Komodo dragon is not fussy with its food choices, it will eat deer, buffalo, birds, pigs and anything else they can get their teeth attached too. As we mentioned earlier the Komodo uses its bacteria ridden saliva or its venum to subdue prey that would naturally be out of its realm, opening up its choices considerably. Not only is the Komodo dragon not fussy, it also likes large food portions and can eat over 70% of the body weight in one sitting, and considering a Komodo can weight over 300lbs that’s one big meal. Where is the Komodo dragon from and where does it live? 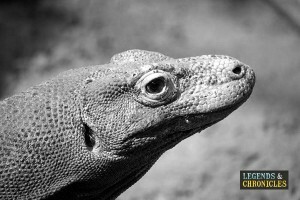 The Komodo dragon takes it name from the island of Komodo which is located in the Republic of Indonesia. While Komodo is only a small island, the dragons themselves can also be found in neighbouring islands, including Flores, Rinca, Gili Dasami and Gili Montang. Due to the limited islands the Komodo dragon resides on, we know quite a lot about its correct habitat. The Komodo likes the savannah and sand of the Indonesian isles. The covering of grasses, small tress, and shrubery allow the Komodo to effectively hunt and enjoy the dry and warm climate, and if they get too hot, the Komodo dragon will dig a hole in the dirt and sand, and give itself some cooling off time, and protection from the sun’s rays. The Komodo dragon is not only one of the biggest giant reptiles, but as we mentioned is considered to be the largest living lizard on planet Earth. They are strong, powerful and can be highly dangerous creatures that have a high status in their natural habitat of alpha predators, marking them as a creature to be feared and respected. With their striking looks, scales and their forked tongue, the Komodo dragon is not only one of the biggest giant reptiles, it’s also one of the most intruiguing, filled with mystique and majesty.